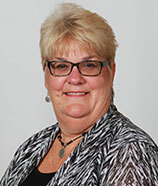 The Treasurer is an elected position authorized by Article 6, Section 2 of the Indiana Constitution and serves a four (4) year term. The primary duty of the Treasurer is that of tax collector. In case of delinquent taxes, the sale of real property to pay for such delinquencies may be ordered by the Treasurer. In addition to property taxes, this office also collects inheritance tax on estates, excise tax from license branches, and is responsible for keeping a record of current property owners' addresses, alcoholic beverage licenses, and mobile home moving or transfer of ownerships. The specific duties of the Treasurer are defined in IC 36-2-10. Pay your property taxes online through Invoice Cloud. Choose real estate, personal, or mobile home property tax. View the most comprehensive property tax sales information through SRI Incorporated. Review all public property tax information through the GIS system. Look up the property with all relevant documents attached to each parcel. Taxes shall be due and payable in two (2) equal installments on or before May 10 and November 10. If an installment of taxes is not completely paid on or before the date, a penalty equal to five percent (5%) for the first thirty days (30), then an additional five percent (5%) thereafter, of the amount of the delinquent taxes shall be added as a penalty. Any delinquent taxes owed in a prior tax period would be a flat ten percent (10%). All penalties shall be based on the principal amount of the delinquent tax. If any due date falls on a Saturday, Sunday, national legal holiday recognized by the federal government, or a statewide holiday, the act that must be performed by that date is timely if performed by the next succeeding day that is not a Saturday, a Sunday or one (1) of those holidays. You must bring your tax statement, pay in full, one or both installments. Banks will stop taking payments the day following the due date. 2. Received by the Treasurer's Office, located on the first floor of the Governmental Office Building at 440 Third Street, Columbus, Indiana on or before the due date. 3. Placed in the Drop Box, located on the south side of the Governmental Office Building next to the entrance of the Commissioners' Courtroom on or before the due date. 4. Certified or Postmarked by the United States Postal Services as mailed on or before the due date. "Postmark" does not mean the date printed by a postage meter that affixes postage to the envelope or package containing a payment. 5. Deposited with a nationally recognized express parcel carrier and properly addressed to the office of the county treasurer, paid in full for final delivery and received on or before the due date. Option #2 Phone: Call 1-800-272-9829 Enter Jurisdiction Code 2506 when prompted. Taxes are due even if you do not recieve a statement. So, you too are having trouble discerning the property tax form. Not to worry, we've added pull-outs to the form below to help clarify any common misconceptions. On the first page of your yearly Property Tax Statement you will find several lines of useful information. The above image highlights several portions of your bill and the details are listed here. 1. This is the State Parcel Number associated with the particular property. When referencing your property, whether at the Treasurer’s Office, Auditor’s Office, or Assessor’s Office, the State Parcel Number is the fastest way to reference the correct property. 2. 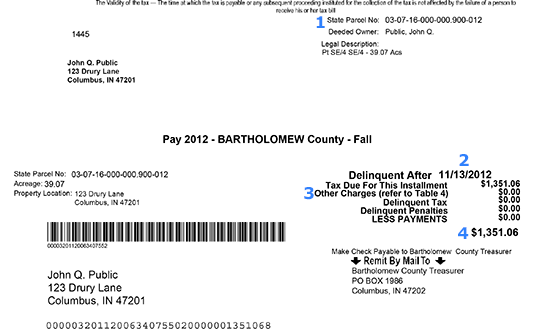 The “Delinquent After” line of your Tax Bill states the last day the amount owed on the property can be paid to the Bartholomew County Treasurer’s Office before penalties will automatically be applied. 3. This portion of your tax bill contains five (5) lines, each affecting the total amount due. “Tax Due For This Installment” denotes the amount of taxes the property owner is responsible for. “Other Charges (refer to Table 4)” denotes an additional amount of money in owed. This can be for services such as drains and will be detailed on the second page of your statement if money is owed. “Delinquent Tax” refers to the amount of taxes owed during previous tax years. Note that any payments made after April 1st will not be included on your statement. “Delinquent Penalties” refers to penalties applied for tax payments that were delinquent. Note that any payments made after April 1st will not be included on your statement. “LESS PAYMENTS” refers to payments that have been made and are credited toward the amount due. 4. The number here is the total amount of monies owed to the County with all of the adjustments preceding the number applied.